Something something, old secrets, blah blah, old queens, humdeedum, exciting intro blurb, continuing with the somethings, apologies for hiatus, more blahing. I just can’t come up with an interesting blurb. Maybe I’ll replace this, maybe I won’t. You can still read the review! I haven’t really talked about Vendel Games to my knowledge. Mostly because I… really haven’t played any of their games. I think. I know of them, of course, they’re in my little folder and their two main series, Love Chronicles and Spirit of Revenge, pop up regularly if you’re looking into HOPA. But I never really felt the need to play any of them, especially not in the slew of games that sounded oddly familiar, like Dark Romance or Spirits of Mystery. Also, any game studio that doesn’t have a website… I’m not sure they really exist. If someone knows of their site, please, feel free to post it in comments or something. But anyway, my first plan was to start playing the Love Chronicles-series but that game turned out to be a little too steep in price for an around 8 year old game or so. So I ended up picking one of their most recent outings. When the queen is accused of being a witch, it falls to you to clear her name as her trusted Guard, like your father before you. But in doing so you will face the past and right wrongs committed many decades ago. And what you discover could have long reaching consequences for the future of this great land. Really, that last part of the synopsis is just me stretching the basic premise of the first sentence. Really, you’re told to go do a thing by the queen and… that’s pretty much it. Yes, there’s more plot there but there’s no great twist beyond the most obvious ones such as betrayals and lies but for once it’s not really about the fate of the world or stopping some great evil from being released. No, it’s just a good old royal backstabbing. That’s not to say the game isn’t engrossing for it is for sure. Once I started it up it was hard to put it down and it moved at a pretty nice pace. 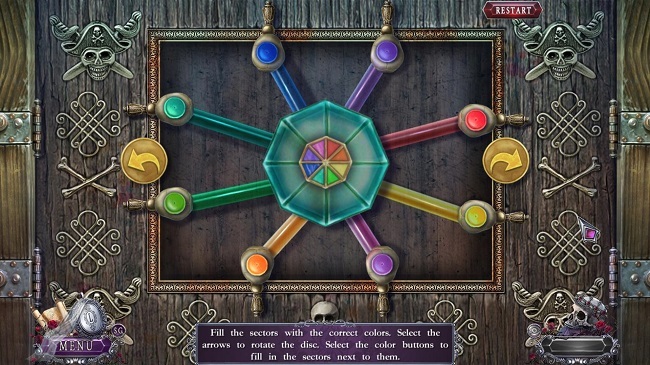 It was divided up neatly in segments that allowed for just the right amount of backtracking and both the hidden object scenes and puzzles were of an adequate difficulty. But I’m getting ahead of myself, I think. Released in 2016, it is still a one off, no sequels or spinoffs exist that I am aware of. A bit of an anomaly in the world of HOPA today. Not rare but definitely not the norm… unless you’re Artifex Mundi. I say this as prequel to my closing argument but I wanted to get it out of the way. The game sports a pretty array of scenes and environments to go through albeit quite… blue. And grey (or gray if you’re of that opinion). It’s not a color scheme I’m particularly enthralled with and while I do understand that these shades convey the atmosphere and feeling they were looking for, I can’t help but to feel that this is 50th time I’ve seen it. A darkish blue and grey castle? It must be Tuesday! I jest for the most part but it is a color scheme that wears on you the more you see it. Some additional environments with other dominant colors wouldn’t have gone amiss. Even the environments that weren’t part of the lonely island and ruined tower were blue and grey and dull. It’s a miracle the inhabitants of this world haven’t become depressed and lethargic if this is the norm. Other than that the graphics were quite nice, they were well made and with good crispness to it. The game used animations fairly often but never in such a way that it called attention to the fact that… well, it wasn’t very good. The 3D animations were, as always, lightyears behind what a AAA studio can pull but as they weren’t used too often it never really stuck out like a sore thumb. The game luckily went easy on the fullblown cutscenes as well, saving them for special occassions rather than animating every single scene in fullscreen animations. I have grown incredibly weary of the “cutout doll” cutscenes with barely animated 2D animations with simple morph transformations. It doesn’t look good and I swear cutscenes used to look better. And had more variety to them as well. 3D, 2D, storybook, liveaction, plain old scrolling text, I may not approve of all of these but they were at least there. Now all games look vaguely familiar, with the same abomination mouths moving entirely unnaturally. But that’s not a jab at this game in particular, just one of my tantrums that are slowly become a regular part. I’m also not entirely certain what happened but during cutscenes the audio also became out of sync. Sometimes it was barely noticeable, other times it was really egregious. What was weird was that it wasn’t all audio either. It’s like they play the cutscenes with some parts of the audio then layered another track that played independently that wasn’t matched or something. I’ve noticed this happens quite a bit with HOPA and I’m not sure why. I always assumed the cutscenes were just queued files that played when you hit certain points, layered over everything else but that doesn’t seem to be the case. If I were to guess, I’d say most HOPA cutscenes were actually comprised of a 2D animation sequence, an audio track for the voices and an additional one for audio that each play independently. So if the animation lagged, the rest came undone. But that’s just a guess and I don’t see the benefit of it. It is, however, the only explanation I can think of. Speaking of audio, the music was very nice. It’s one I’m seriously considering adding to my permanent library of music. Somber when it needed to be, atmospheric when called for, uplifting in times of need, it really fit the game quite well and whether it was made specifically for the game or was purchased and used out of a library, it was well matched. What I didn’t like so much were the voices. 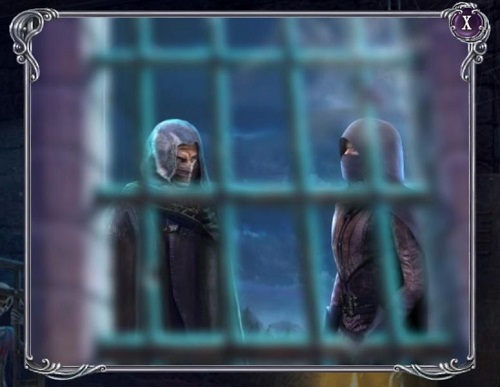 For the most part it was quite alright, never reaching the annoyance of many performances in HOPA but because it was set in “ye olden days” it seems they thought the voices also had to be made to sound like that. The problem is, of course, that very few people can reliably and realistically pull such an accent and tone off. Some did alright but many were just obnoxious to listen to. And all villains spoke with this gravelly, evil voice that I have associated with villainy since my childhood and I feel it’s unfair to people that actually speak like that… if there really are any. 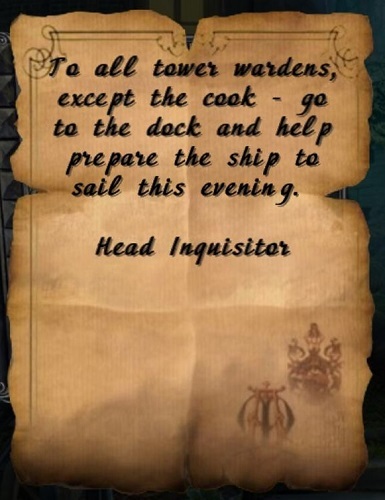 Perhaps fortunately then, much of the backstory and lore of the game was delivered either in simple images or through journal entries and letters picked up during the adventure. And it’s quite an interesting backstory too, mixing in some ghosts and witches with the Inquisition. I really would’ve liked to explore this aspect more throughout the game but that’s the limitations of format, I suppose. If you want your game to come in under or around four hours, you can’t really dilly-dally, gotta get that plot going! Luckily for the game then, I didn’t really come for the plot. 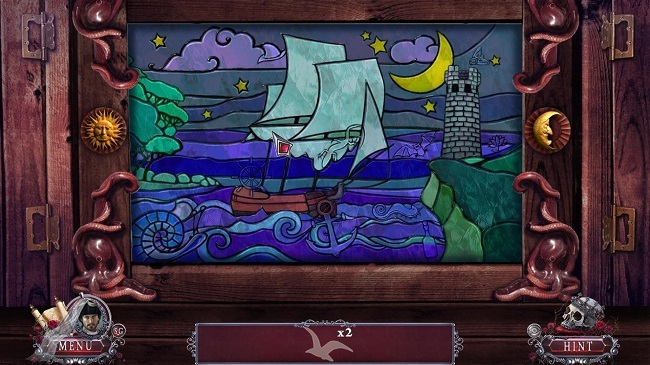 I came for the hidden object scenes and the puzzles. Surprisingly it did really well in both these areas. 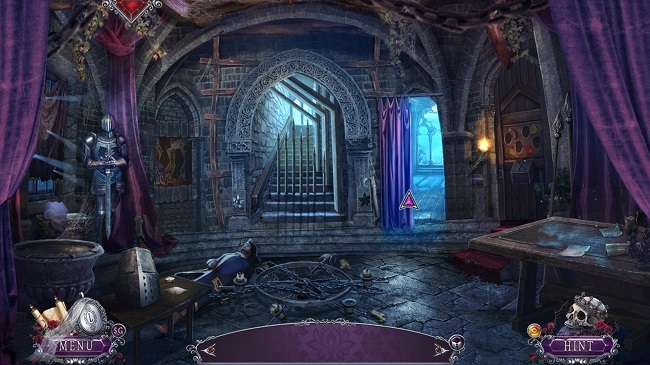 I’ve sort of started to assume that I will be disappointed in the quality of the puzzles going into a modern HOPA as they don’t really seem that interested in challenging you anymore. I would like to assume I’m just too smart for these games but my humble swedishness refuse to allow me this simple mindset. Regrettably the game didn’t really push the challenge all that much, most of the puzzles were pretty straight forward and you had your standard array of jigsaw, memory and matching puzzles but they did try their ultimate to introduce a slew of variety. Whereas they easily could’ve gotten away with standard puzzles and called it a day, most of them were always given some unique twist that made them feel fresh. They weren’t, of course, and once you grasped what the basic puzzle was underneath it was typically a cinch to solve but one or two did give me pause, I’ll admit. It was also one of the few places where the game deemed it worthwhile to add splashes of color other than blue, grey and red. I didn’t mention red before because it’s sort of a spoiler but I kinda gave that away in the featured image, didn’t I? Anyway, I liked the puzzles for the most part. 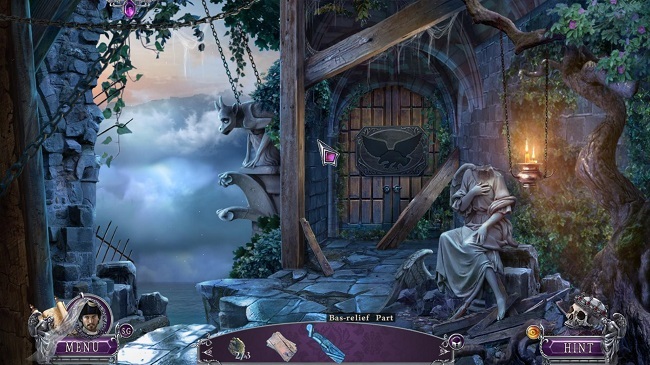 Now, what I REALLY liked were the hidden object scenes. Not only were they really well designed for the most part, they were creative. 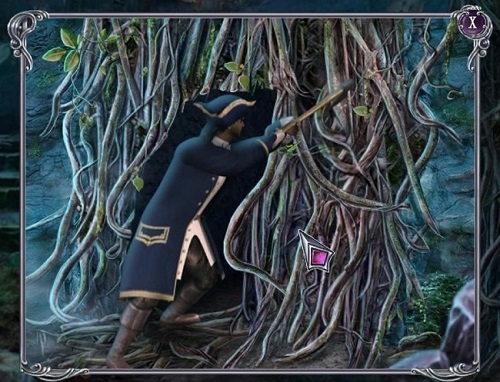 The basis, per usual, were the list ones but other than that you had a wide variety of hidden object scene types, ranging from silhouttes, fully interactive and “reverse hidden object” where you place items rather than find them. The items were reasonably well hidden and while none ever took me very long to complete, they very often left me with a bit of a smile. If you’re into HOPA for the two first letters primarily, this is easily a good one to get your fix. You also got to revisit quite a few of them which is an easy way to win me over. If you’ve read my reviews in the past, you know this is something I comment on quite often. I know, broken record and all. As for the adventuring aspect of HOPA, the final piece of the acronym, I was pleasantly surprised when this wasn’t as much of a use it and lose it kind of adventure. Some items were used more than once and a lot of the time things made a lot of sense. There were… hmm, moments where the sequence of events weren’t always so clear and it took a bit of a leap of logic to progress. 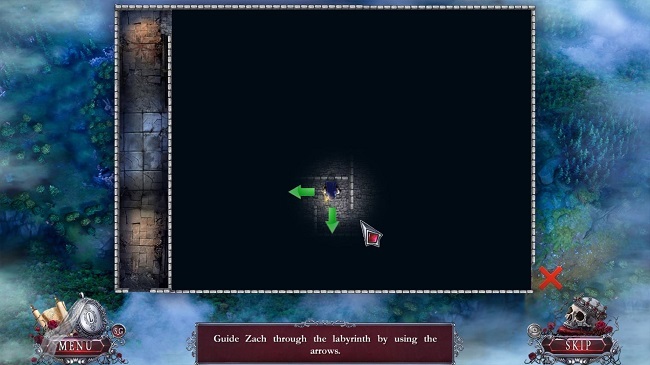 It also didn’t help that the environments lacked clearly marked areas of interest so you had to swoop your cursor back and forth over the screen to ensure you hadn’t missed something interactive or a waylaid item. Yes, I’m gonna keep harping on about these things. Once you got into the subtitular “Old Tower” things got really muddy in terms of progression since things did seem to take on a rather illogical guise. Items weren’t really in or used in places that made sense and the extravagantly shaped keys and locks become numerous. Emblems that needed fitting or empty chest pieces became the norm rather than silly little eccentrics. Your little helper friend was also an odd little duckling. In modern HOPAs, a helper friend is virtually a requirement, especially for games that intend to franchise. It’s an easy way to tie games together and to make them easily identifiable. Normally this role is filled by a cute little critter or a small robot of some sort. That then patiently sit there in your UI, waiting for the few moments where it was actually useful, commonly clearly signalled by the game. 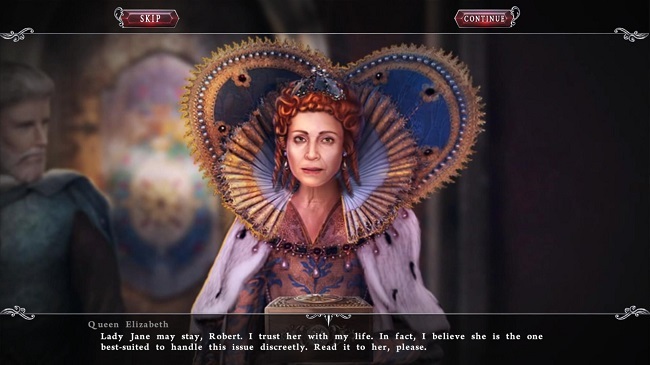 In “Secrets of Great Queens”, not only was your helper used quite frequently, it was also a fully adult man, often ready with a quick quip or a flirtatious one-liner to the female main character. Not only that, but at times it wasn’t just enough to use him in the right place, he sometimes needed specific items to be able to do it. So rather than just using the item, you gave it to him so he could proceed to do manly things. I was planning on mentioning that the fact that the female hero needed a man to do what appeared to be relatively easy task is a bit insulting, in my opinion. At times it was merely a matter of pushing something out of the way or climbing on things, activities my player controlled character seemed perfectly able to do herself. I do find it curious that despite being made primarily for women, the games have a rather conservative attitude to women’s behaviors or roles. Yes, they’re great detectives or explorers but if you ask them to dig with their hands they’ll complain about broken nails or just getting dirty. Perhaps I should take comfort in the fact that the player character and the male helper friend didn’t end up marrying or even getting together in the end. Oops, spoilers, I guess. So then, is the game worth investing in. Both time and money? Yes. I am rather surprised that this game didn’t end up becoming a franchise on its own. It might still, it’s still been less than two years since its release but typically HOPA are rarely revived after two years of absence. But the title is rather hinting that that was the intention. It’s not “A” secret or a singular queen but rather plural on both. The fact that it turns out to not be any secrets is another matter, nor are we given any sort of indication that the queen in question actually was… you know, great! It had all the right parts but the future never seemed to materialize. Perhaps it sold poorly or people didn’t like it. Or perhaps it will return. I might even look forward to that a bit. If nothing else, I’ve decided that Vendel Games are definitely worth the effort from now. Though the lack of a website does have me worried, it makes it difficult to keep track of them. So, Vendel Games, all this post was for was to tell you: Make a bloody homepage already.